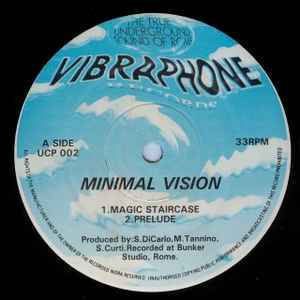 Vibraphone Records declares the record as "Minimal Vision". The labels have the tracks sequentially numbered, without durations. A: Recorded at Bunker Studio, Rome. B: Recorded at MAD Studio, Rome. So has the repress for this actually come out yet? Any idea when? Repress does not include the exact same tracks but new slightly different versions. Also, for the video games freaks,the Magic staircase melody resembles the one from the final fantasy series called "Prelude"
One of the most spectacular deep/tech house releases I've ever heard. Judging by the titles of the tracks, it is intended for you feel as if you're lifted into space, on a journey through the galaxy aboard the spacecraft of imagination. Even though this was released in UK - it is actually an Italian early 1990s deep house production (see production + recording credits). Italian house music of that era is pure magic! Check out the rest of this Vibraphone and MBG International labels for more similar top quality deep house gems!